Learn all about the inner workings of a dental implant. If you are dealing with one or several missing teeth, then chances are you have been conducting a lot of personal research and talking to your Stamford, CT dentist about treatment options. It’s vitally important to act fast and to treat your tooth loss so you don’t have to deal with further problems as a result. If you’ve been scrolling the Internet for treatment advice then you’ve probably heard about dental implants. However, how much do you really know about this tooth replacement treatment and how it works? The implant: The implant is a tiny titanium post that is surgically implanted into the bone of the missing tooth’s socket. The main purpose of the implant is to act as a tooth’s root. An abutment: This metal piece is placed over the implant and serves as a connector between the implant and the artificial tooth. A dental crown: This crown is securely held in place by the abutment. 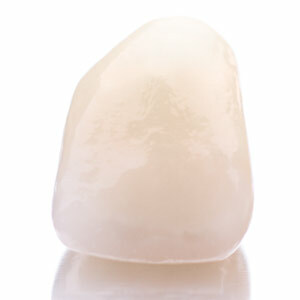 Dental crowns are also used to preserve a damaged tooth, particularly after root canal treatment. After the implant is surgically placed into the jawbone, we allow the implant to remain there for several weeks. During these weeks of healing the surrounding gums and bone start to grow around the metal, making it a permanent foundation which will hold the crown. Once this process is complete, we will place the abutment on the implant. The last step is to then securely attach the dental crown to the abutment to give you a complete smile. This treatment process can take anywhere from six to eight months to complete and two separate procedures are required. Dental implants can be treated just like regular teeth, which also means that you need to continue to brush and floss normally. Even if the crown can’t develop decay the surrounding natural teeth are still susceptible to cavities and gum disease, which can cause an implant to fail. That’s why anyone who wants to get implants should be ready to keep up with their oral hygiene. If you are interested in finding out if you’re an ideal candidate for dental implants then call our office today. Your Stamford, CT dentist would be happy to sit down for a consultation and determine how to best restore your smile.